Dr Sarah Weston is an archaeologist working at a site in Ethiopia when she bumps into a stranger who tells her of a cave in the hills above her camp. The man shows her shards of pottery that seem unusual and so, her interest outweighing her personal safety, she agrees to meet the man the following day and trek to the cave. When she gets there, she finds strange markings and inscriptions that imply this is an undiscovered marvel. She reports her findings to her mentor back in England and he is less than impressed with Sarah's lack of commitment to her current project. He informs her that an American anthroplogist, Daniel Madigan, is joining her "dig" and will be keeping an eye on her as there are concerns she is not the person her sponsors want for their project. Sarah shows Madigan her findings and it becomes apparent this could be the tomb of a lost Coptic Saint and the writings are a portent describing how and when the world will end. What follows is a fast-paced, girls own adventure steeped in history and myth as Sarah and Madigan try to solve the mystery and stop the prophecy from coming true. Okay, this is not strictly a historical fiction novel and for the purist readers of the genre who kindly follow my blog, I apologise for that. But this is a very good story that will satisfy the historical element, excite those who like adventure, enthral those who love conspiracies (me!) and have you devour every twist and turn of the plot. D.J. Niko has followed a well trodden path by writing in this genre, but the sign of a great writer is how they make the story unique, or give it an edge. The use of a female protagonist who is beautiful but tough, single-minded but unbiased, is unusual but works extremely well. Niko has found the perfect balance in her character to turn the stereotypical female heroine on its head, if I have a criticism it is that more should have been done to Daniel Madigan to make him unique as he is a bit too "Indiana Jones" and this I feel detracts slightly from Sarah Weston. Overall though, this is a good read. It is full of suspense, the historical theme has been well researched and the plot flamboyant. This is a perfect book to read if you want a bit of comfort on a cold, wet day when you want some excitement. 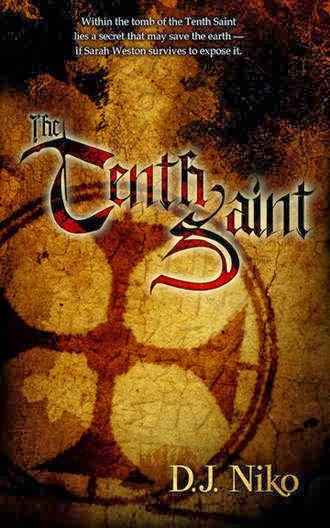 I give "The Tenth Saint" 4 Crosses!